So I made a mini promise to myself that I couldn't start a new sweater project without finishing an old one. Who knew I would actually keep that?? It helped that the sweater that I had to "finish" only needed a few inches on the front and a few picked up edges to complete – oh that and it's a Vest. I casted on for this last August while up at Otter Lake. I remember at the time I had wanted it to be an October FO but then a few other things got in the way. I actually had it in the "out of sight/out of mind" bin. It was only when I needed size 4 needles for another project did I happen to rummage it out and put it somewhere visible. Gosh what took me so long. You know, I don't know what I love more – the rustic texture of the yarn or the texture of the pattern, perhaps it's the marriage of them! I actually even made a little mistake – I used US2s for the ribbing on the neck and arm hole. I actually like the way it looks so I didn't bother to rip it out. I also finished a super quick and easy scarf after being inspired by one I saw at Loop in Philly! There's probably nothing more enjoyable than being able to drop your stitches on purpose! More details on Ravelry. Speaking of scarves, wowsers did you guys come out of the statistical woodwork for the last post! I was flabbergasted at the idea of 900 hits!! Oh HI all new readers! It's really been fun seeing people starting to cast on for one so I hope to see more infinity scarves all over blog land! Last but certainly not least – if you are going to be in the Hoboken area this weekend Patricia's Yarns is having a meet and greet with knitwear designer, Teva Durham! I am so looking forward to hanging out with her for a few hours tomorrow! See Patricia's site for more details! I love both vest and scarf! Gorgeous and very good photography too! That vest is awesome! The color is great, too.. nice to see something a little different. The color is stunning, beautiful vest. That vest is lovely! What a perfect color for October. I love the vest, and the scarf!! I’ve been thinking about that honeycomb for a while, and yours makes me wish I already had one underway! Your layering skills are incredible! 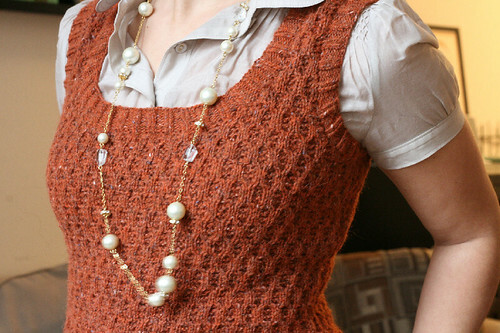 It’s one thing to knit cute sweaters, and it’s another to be able to incorporate them into your wardrobe, flawlessly. You do it every time! Yay! 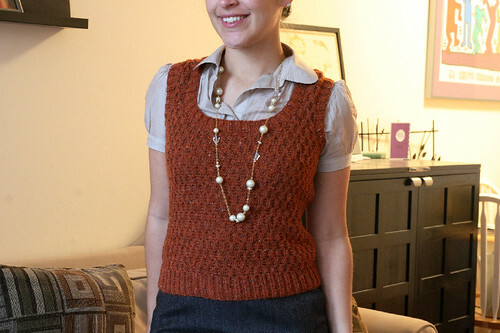 I remember when you started the pumpkin vest- it’s gorgeous! xo-S.
Oooo – the Honeycomb is GORGEOUS! Great work. the vest is beautiful! a really great color for you. The vest looks divine! I wish I had the figure for it. 🙂 Now I must look at the infamous 900 hit post. That vest is gorgeous! It looks fantastic on you. Can I ask where you got that necklace? Such a great piece of jewelry – I love your style! The vest is marvellous, the colour is perfect! I am knitting Honeycomb also. Please tell me, how did you bind off the ribbing in neckline ? Did you knit all stitches as you bound off or bound off as the rib pattern – 2 purled, 2 knitted ?stitches)?